Aliens have invaded office buildings and make people work overtime, cut coffee breaks, and give unreasonably tight project deadlines. Noob Powers, mixed martial arts superstar, is back in action for the job, and as always he's followed by a TV commenter and huge home audience! Fight your way up floor after floor as NoobTV discusses your every move, and see your viewer ratings go up and down in real time. 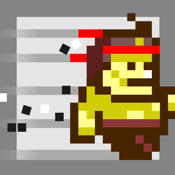 In this high-speed casual endless runner, you are always only seconds away from the commercial break. Increase your time by knocking out aliens, destroying calendars, firing rockets and serving employees coffee! Please rate this game 5 stars if you like it, and send questions and other feedback to philipp.lenssen@gmail.com. See the video at http://youtube.com/watch?v=-gZQE4g-uPA . Noob Powers supports Game Center so you can share your highscore. Now get running and find out -- how many millions of viewers can you get to watch NoobTV?